The gooey mozzarella, tomato sauce, with the fresh bite of basil goes great together. I can see why i margherita pizzas are a timeless flavor combo! Start things off by getting a pan on medium heat, with a light coating of olive oil. While the pan is heating up, build your sandwich. Spread pizza sauce on each slice of bread, chop up your basil leaves and sprinkle them on the sandwich along with a sprinkle of garlic powder. 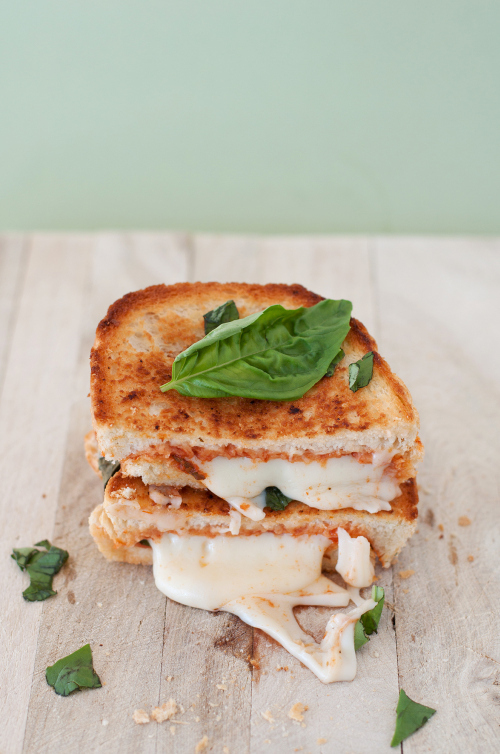 Place the mozzarella on top and combine the slices of bread. Lightly brush olive oil on each side of the sandwich. I used basil olive oil which worked wonderfully, but regular olive oil is just fine! Once the pan is heated, grill your sandwich until golden brown on each side, serve with a basil leaf on top for decoration (if you’re into that!) and dig in!